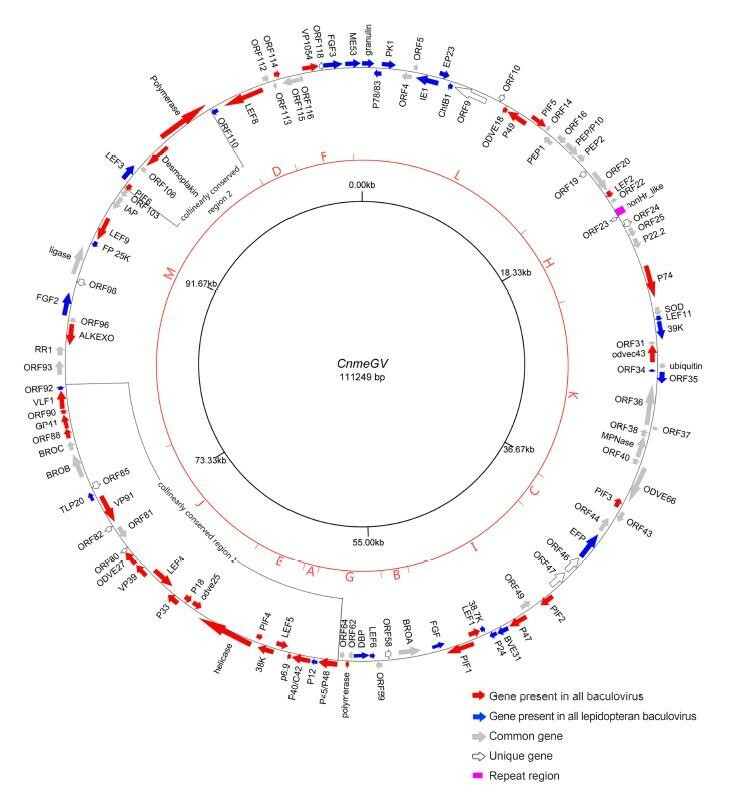 The complete genome of Cnaphalocrocis medinalis granulovirus (CnmeGV) from a serious migratory rice pest, Cnaphalocrocis medinalis (Lepidoptera: Pyralidae), was sequenced using the Roche 454 Genome Sequencer FLX system (GS FLX) with shotgun strategy and assembled by Roche GS De Novo assembler software. Its circular double-stranded genome is 111,246 bp in size with a high A+T content of 64.8% and codes for 118 putative open reading frames (ORFs). 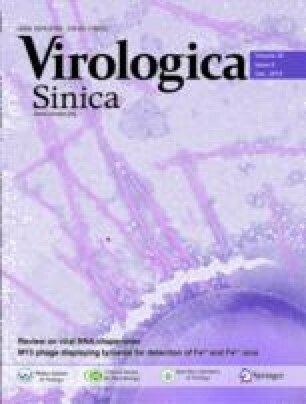 It contains 37 conserved baculovirus core ORFs, 13 unique ORFs, 26 ORFs that were found in all Lepidoptera baculoviruses and 42 common ORFs. The analysis of nucleotide sequence repeats revealed that the CnmeGV genome differs from the rest of sequenced GVs by a 23 kb and a 17kb gene block inversions, and does not contain any typical homologous region (hr) except for a region of non-hr-like sequence. Chitinase and cathepsin genes, which are reported to have major roles in the liquefaction of the hosts, were not found in the CnmeGV genome, which explains why CnmeGV infected insects do not show the phenotype of typical liquefaction. Phylogenetic analysis, based on the 37 core baculovirus genes, indicates that CnmeGV is closely related to Adoxophyes orana granulovirus. The genome analysis would contribute to the functional research of CnmeGV, and would benefit to the utilization of CnmeGV as pest control reagent for rice production. Supplementary material is available for this article at 10.1007/s12250-015-3658-4 and is accessible for authorized users. Supplementary material, approximately 265 KB.